ALL ABOARD! It’s time to take a trip of a lifetime! ALL ABOARD! It’s time to take a trip of a lifetime! Learn about history as we travel back in time to explore ancient civilizations like the pharaohs of Egypt, the knights of medieval times, and the Vikings. We will also create our future as we travel into it to discover new technology, cultures and beings from other worlds. So hop on into the FUTUREKIDS time machine as we explore and discover the past & future. Alakazzam! You are now turned into a powerful wizard. Alakazzam! You are now turned into a powerful wizard. Join the rest of your fellow wizards at FUTUREKIDS place. Go to wizard school as you learn how to create spells, potions and costumes. Enter the world of wizards and witches and test your memory skills against orcs, ghouls and goblins through Mind Lab games. Are you ready to RUMBLE!! A mighty foe has come to take over your planet and it is up to you and your band of characters to fight against them or with them. Create and customize your cast characters. Learn the tales of some of the most famous monsters as well as space travel & the planets. Create a story & illustrate a story of how this epic battle will end. Will your battle have a one eyed monster, or pig like space creature? It is all up to you. Let the battle begin! Get ‘two scoops’ of math learning fun when you take on the role of a busy ice cream truck owner! Get ‘two scoops’ of math learning fun when you take on the role of a busy ice cream truck owner! You get to decide what ice cream flavors you want to sell, promote, and decorate your truck to attract customers and decide where to sell your ice cream. Finally serve the customers, while you use an interactive cash register to tally sales and profits. You can choose to exploring the FUTUREKIDS educational software library at your own pace, as you develop logic skills to increase your visual and mental acuity. Don't want to play games? Well you can use this extra day to enhance the skills you have learned in your camp. Explore other methods of creating your masterpiece to make your project even better! Think your masterpiece is done? Well join us in our world renowned Mind Lab program. Explore various strategies to some of you favorite board games. You’re on a case to find a stolen dog! You’re on a case to find a stolen dog! 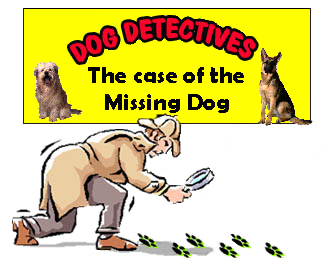 As a detective, use your skills to find the missing dog by questioning her/his canine and human friends. Create and design reward signs. Analyze the dog's belongings to find clues that will lead you to his/her captor.